Win WIn, directed by Tom McCarthy, hits theaters March 25. Screenwriter/director Tom McCarthy held a pre-screening of his newest film "Win Win" on March 2 at Landmark Century Theater in Lakeview. In January, Win Win played to rave reviews at this year’s Sundance Film Festival in Utah. 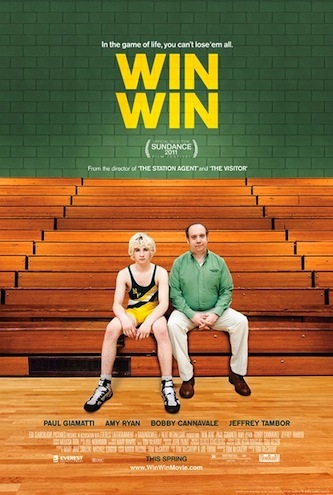 The film portrays a struggling suburban New Jersey lawyer and high school wrestling coach Mike Flaherty (played by Paul Giamatti) who takes on the responsibility of caring for an elderly client’s grandson (Alex Shaffer) after his mother enters a rehab program. Following the screening, McCarthy, discussed aspects of the film and answered questions from audience members. McCarthy, who co-wrote "Win Win" with high school friend Joe Tiboni, talked about the emphasis on character development throughout the film. McCarthy added that one of the biggest hurdles in producing "Win Win" was casting the 16-year-old Kyle. Because of the number of wrestling scenes, McCarthy held castings for actual high school wrestlers only, in order to improve the realism of the film. This film was Shaffer’s theatrical debut. Two weeks after being cast for the role, Shaffer actually went on to win the New Jersey state wrestling championship in his weight class. This is McCarthy’s third film as a director. However, prior to his previous directorial efforts, "The Station Agent" and "The Visitor", he developed a successful career in film and television acting. McCarthy appeared the HBO series "The Wire"and in critically acclaimed films such as 2007’s "Michael Clayton." McCarthy's latest film is an ode to New Providence, the suburban New Jersey town that he grew up in. "We wanted to portray the suburb and this particular community as a place as where this guy [lead character Mike Flarety] wants to live," he said. "It is his dream—to raise a kid, have a small business—and that’s his life and we really didn’t want to condescend that or patronize it in any way and a lot of that was through Paul’s eyes and his performance." "Win Win" also stars Amy Ryan, Bobby Cannavale and Jeffrey Tambor. The film opens nationally March 25.